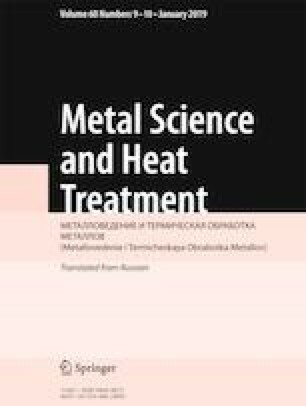 The microstructure of self-fluxing Ni – Cr – Si – B coatings formed on steel plates with the use of non-vacuum electron-beam cladding is studied. The effect of the structure and phase composition of the coatings on the level of their hardness is determined. Translated from Metallovedenie i Termicheskaya Obrabotka Metallov, No. 10, pp. 18 – 25, October, 2018. The work has been performed with financial support of the Russian Federation via the Ministry of Education and Science of the Russian Federation (Agreement No. 14.610.21.0013, Project Identifier RFMEF161017X0013).